Win Human Planet on DVD! Once again the BBC has produced an amazing series with stunning camera work and compelling stories! From the highest, coldest mountain peaks to the hot, dry tropics, this series takes a look at how humans live on this varied planet. 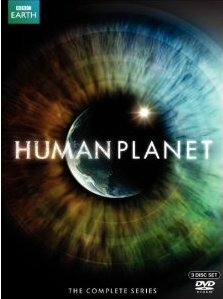 Human Planet arrived on DVD and Blu-ray April 26, just two days following the broadcast conclusion. Human Planet is the first BBC/Discovery Channel co-production to focus solely on human behavior. Since premiering in the UK, the series has received overwhelming critical acclaim including The Telegraph proclaiming, "it’s like nothing you’ve ever seen before" and The Sun stating that it’s "visually stunning and utterly fascinating, this is seriously impressive stuff." From the makers of Planet Earth, Life and Blue Planet, Human Planet focuses on humanities amazing, complex and profound relationship with nature. It weaves together 80 stories, many never told before, to illuminate humanity’s uncanny ability to adapt and live in every corner of our diverse world. Each episode centers on a particular habitat, and by using innovative and cutting edge filming techniques, reveals how its people have created astonishing solutions in the face of extreme adversity. The Discovery Channel version will be presented by Charles Parnell and consists of six episodes that will take viewers to the farthest reaches of the globe culminating with, Life at the Extremes, a "best of" episode. The Human Planet DVD and Blu-ray will include all eight episodes from the original UK broadcast version, presented by John Hurt, extending the home viewing experience with three hours of footage not seen in the North American broadcast. It will include the episode, Cities, which will be exclusive to the DVD and Blu-ray. Additionally, the DVD and Blu-ray will take viewers deeper into the heart of Human Planet with its set of ten Behind the Lens "making of" bonus features, and, exclusive to Blu-ray, a further "making of" feature called, Zanskar, accessible via BD-Live. Zanskar showcases the astonishing life struggles of a resilient group of people living at the edge of the Himalayas. 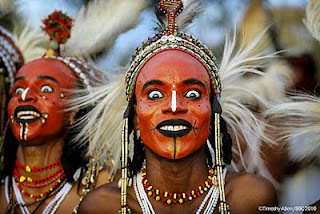 Visit Human Planet on Facebook! Thanks to BBC, I have 3 copies of this gorgeous DVD series to give away! To enter, just leave a comment with the most amazing place you've ever visited. That's it! The giveaway will end on May 13. Please be sure that your email address is listed in your comment or your Blogger profile so I can contact you. Open to residents of the USA and Canada. I will choose the winners with random.org and the winners will have 3 days to contact me with their addresses, or I will have to choose alternate winners. Disclaimer: I received 3 copies of Human Planet from BBC to use as prizes in this giveaway. We don't travel much. Our most memorable family trip was Disney World in Florida and it was quite beautiful, even if it was all part of a resort. That said, I really enjoyed the natural beauty of New Hampshire this past summer. The most amazing place I have visited was the state of Alaska. I was there during the summer and couldn't believe all of the flowers, snow covered mountains, and the abundance of wildlife. The most amazing place I've traveled to is Tuscany, Italy. I so badly want to go back and also to see the myriad places I have yet to visit. The most amazing place I've ever gone was Maui Hawaii. I didn't want to come home! The Big Island of Hawaii. It has everything--mountains, beaches, and even active volcanoes. The most amazing place I've is Lhasa, Tibet, and I'm not sure I could even begin to describe the experience. Three days and burnt into the brain forever. I would say Tierra del Fuergo in Argentina...went there while our family was living in Buenos Aires for my husband's job. The most amazing place I've visited was Nootka Island on BC's coast before it was developed. Raw nature at it's best!! Thanks for hosting the giveaway. I appreciate it. Belize was amazing. I would love to go back, but I have so many amazing memories - the people, the snorkeling, the jungles, howler monkeys, Mayan ruins. All fantastic! It would be the grand canyon. Visiting the Big Island of Hawaii was amazing! Puerto Rico...the history, beautiful beaches and rainforest made for an amazing trip! Cruisin through the Panama Canal. This one is easy - We visited Italy and toured Venice, Florence and Pisa! The leaning tower was the highlight of the trip. Beyond WOW! This one is easy - Pisa Italy! The leaning tower was beyond WOW! I haven't traveled much, but a memorable trip for me was New York City. It was a wonderful trip. When I was 7 yrs old my family and I went to Yellowstone National Park, saw Old Faithful, Badlands, Mt. Rushmore, all those good things. Would really like to go back it's been 50 yrs. The most amazing place I've been is Lille in France. It was just so different to see how other people live. I was in the Swabian Alps, in Germany. The scenery is amazing and the mountains are littered with castles. I was born there and have traveled quite a bit, but the Atchafalaya swamp is still the most interesting place I've ever visited. The most amazing place I've been is India. Rome - specifically St. Peter's Basilica and The Pantheon. I'll say North Pole, Alaska. My husband's from there and it's like Christmas year round. The most amazing place that I have visited is Hawaii. I never knew the water could be that blue! I have to say, it would be New Orleans. There is a magic to that city! The Grand Canyon is incredible at sunset and sunrise!